London’s home of underground house, techno & good times is back at 3 floor building Chapeau Rouge Prague. Join the troops partisans! On the house floor we have Monterrey, Mexico born Puente whose latest releases have been delivered in a handful of underground labels such as Bon Vivant, HouseWax, Budare, Hat Swing, Outstrip Wax, Oblack Label & Blind Vision Records. Puente has played at in respected clubs and festivals all over the world including Piknic Electronik, DGTL Festival, Monarch San Francisco, Tresor Berlin, Lost Beach Ecuador, Kazantip Festival in Ukraine and many more. Techno floor will be under full control of Republic Artists head honcho Thomas Tesla and Georgian Ly Sas. Bar stage will be taken care of by a local talents Asi and Brigitte Noir! Republic Artists have been throwing parties in London since 2007. 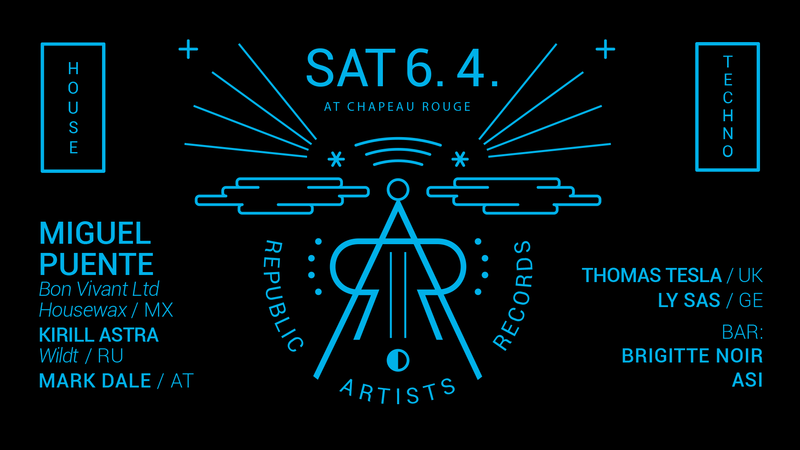 Republic Artists Records was born in 2014 to present the sound of those parties to the rest of the world.